Distinct cat hammock will make you and your cat happy! The Cat Above cat hammock affords your cat a wonderful elevated vantage point. The hammock sling molds to your cat's body, providing a sense of warmth, security, and comfort. Year round, this cat hammock will be your cat's favorite place to hang out! 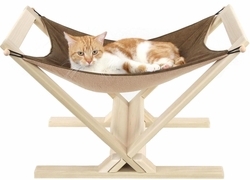 Here is why you'll love this cat hammock: This high quality cat hammock, made of 100% hardwood, is sturdy yet lightweight and can easily be moved around the house - by the sliding glass door, near the radiator, in the bedroom, to a spot of sunshine. Lovingly handcrafted in the USA, this cat hammock looks good anywhere. The cat hammock is made of four parts that slide into each other in seconds for easy setup, using no tools. And, of course, it can be taken apart just as easily to store flat or travel. 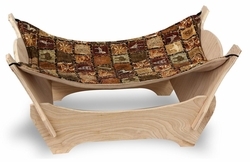 When it comes to cat hammocks, our wood-frame cat hammock stands out in its design and quality. Pamper your cat with a cat hammock! Our products are lovingly crafted in the U.S. The SnoozePal cat hammock is truly one of a kind: the ultimate cat hammock! It's a cozy cat hammock in a box - and what cat doesn't like boxes? Your cat will happily hang out in this made-especially-for-kitty box. The heavy-duty cardboard box encloses a comfortable hammock sling to snuggle in. It gives your kitty an elevated spot off the floor and has porthole windows to keep an eye on everything. 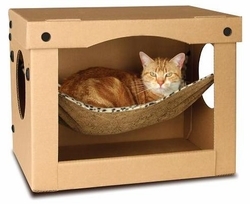 The cat hammock box is highly durable and its hard, smooth surfaces discourages scratching. SnoozePal™ is one of the cutest cat hammocks ever! And for those felines who like to perch higher up, the SnoozePal cat hammock top has extra reinforcement, providing plenty of support, for two or even three cats at a time. A hammock and a box - two things that cats love. Elegant cat hammock bed from Cat Above! The latest in our distinctive line of cat hammocks: the cat hammock bed has a stylish design that will look great anywhere in your home. In line with our approach to designing cat furniture, it is made of four panels that slide into each other for instantaneous assembly. The cat hammock bed can also be dismantled in seconds and stored flat. The hammock sling is available in attractive fabric designs. Would you like to be on our e-mailing list? Would you like to learn about special offers and promotions? A portion of our profit is donated to a cat rescue organization. Please see We Support Animal Rescue for details.